If seeing ever really was a reason for believing, it surely was not in New York around 1900. The rift between appearances and truth was widening: deceptive images flourished in advertising and mass media; science contradicted unaided vision; the spirit world gained credibility; and hucksters, frauds, and hoaxes proliferated. 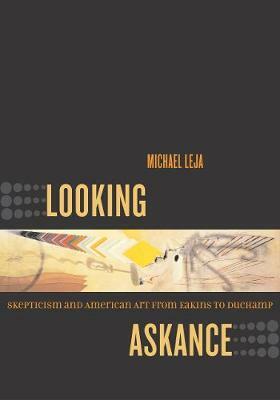 In Looking Askance, Michael Leja conducts a dazzling tour from fine art to mass culture and back again to chart the emergence of a new skepticism about seeing and to assess the roles played by the visual arts, both fine and commercial, in this cultural transformation. A lively exploration of the relationship between modern art, truth, and deception, Looking Askance offers a new paradigm for understanding American visual culture, from the art of Thomas Eakins, William Harnett, and Marcel Duchamp to such fascinating historical episodes as the trial of spirit photographer William Mumler, scientist Helen Abbott's interpretation of Monet's Impressionism, the myriad illusions featured at the Buffalo World's Fair of 1901, and William James's analysis of automatic drawing. Leja traces the roots of skeptical seeing in the culture of modernity and in national values of entrepreneurship, invention, competition, and unregulated marketing. This brilliantly pluralistic study will resonate with a broad spectrum of multidisciplinary interests. Tracking the way questions about the nature of seeing inform self-constructions of the modern subject, Leja moves flexibly through a wide range of surprisingly diverse materials, linking spirit photography, world fairs, circuses, automatic drawing, realist painting, and Marcel Duchamp. In true skeptical fashion, Leja trains his eye on the ambiguities of his materials, refusing to let them settle into either a celebratory or a cynical narrative. Opposites are revealed as similar (P. T. Barnum's humbug and George Washington's truth-telling both play on the motif of deception), while humbugs manifest difference (a radical fear of dishonesty versus a source of delight). The final illuminating shift in this complex study is thus from the modern need to negotiate multiple and layered realities to the manifold optical lenses of Leja's own kaleidoscopic approach.